There is a reason these guys are also known as stink beans – their effect on your pee the next day is quite similar to that of asparagus. More than that, if you’ve had quite a bit, a few hours after consuming them, you’d better be generous with that deodorant and breath fresheners! 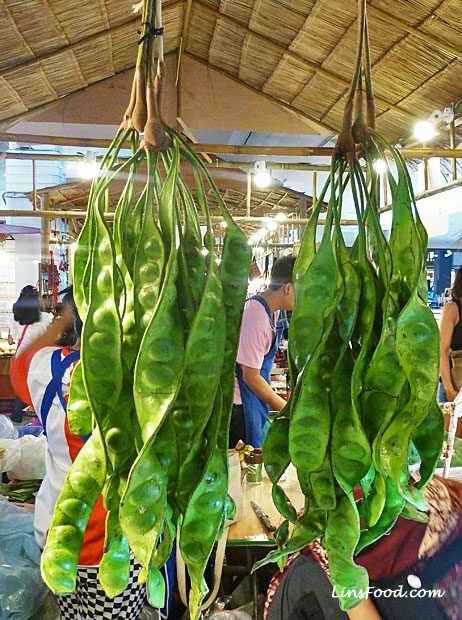 Inside these long twisty Parkia speciosa pods, you’ll find small, oval shaped, flat green beans the size of large almonds that are much loved all over South East Asia. They are quite bitter and are therefore, almost always cooked or served with stronger tasting flavours like dried shrimp or shrimp paste. They are quite a polarising vegetable, not quite on the grand scale as the durian but Petai have been known to make enemies of brothers! Half my family detests these little green devils, the other half loves it! Why you might ask. Mmm, I really don’t know! For the same reason that I love okra and brussels sprouts and broccoli? Because I do?! I can tell you that when I was back in Singapore last month, I did indulge on more than a couple of occasions and I must say, enjoyed every bit of it! And I still can’t tell you why! Perhaps others eat them because petai are believed to have many nutritional and health benefits, the most important of which, but not scientifically proven, is as a cure for diabetes. It is also believed to relieve constipation, cure hangovers, reduce nausea and heartburn symptoms. Here, I give you a simple recipe for cooking with petai, if you happen to have access to them. 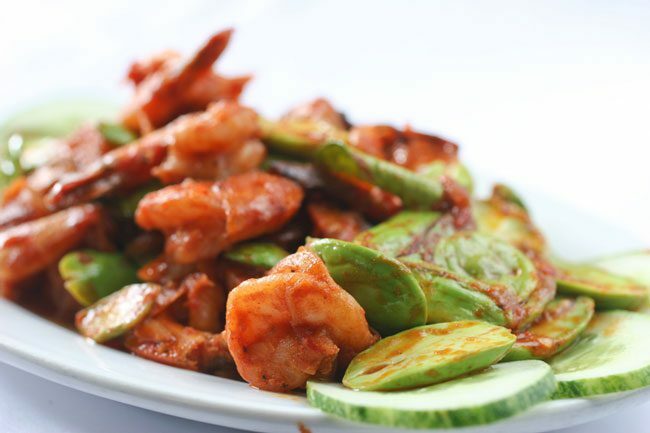 This is sambal petai or because of the use of prawns (udang in Malay), sambal petai udang. It’s a fairly quick recipe to make and the sambal will keep in the fridge for a day. Pound or chop all the ground ingredients into as fine a paste as possible, adding water as necessary. Heat the oil in a medium frying pan or wok on medium heat and fry the paste for a couple of minutes until fragrant. Add the water and simmer, uncovered, for about 10 minutes until slightly reduced. Add the prawns and petai and cook for about 3-5 minutes until the prawns are cooked through, depending on their size. Serve with white rice but also good with french baguette! It is not accepting my Printer, Canon MX 376.